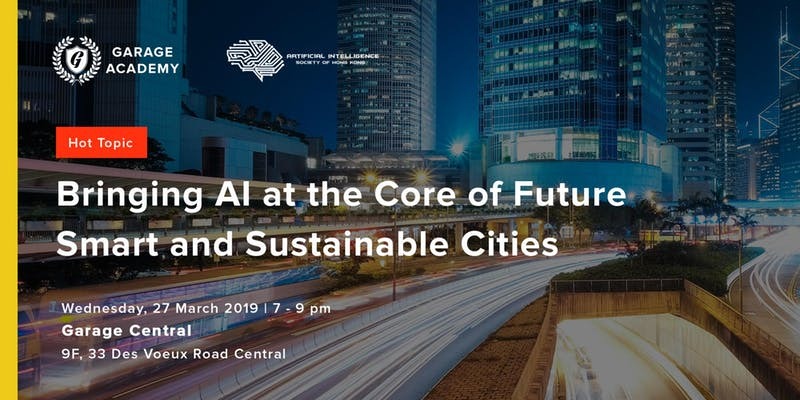 AI Society of Hong Kong is back at Garage Academy on Wednesday 27 March for a deep dive on AI in smart city development — sign up now, limited seats available! Urban sprawl is fast and inevitable. With this rapid expansion, sustainability becomes a challenging issue. Most infrastructures are not adapted to the current population, which causes various problems including traffic congestion, increased pollutants emissions, escalation of waste production and insufficient recycling facilities, meanwhile increasing poverty, and inflation of housing prices. To circumvent these challenges, more and more sensors have been deployed around cities, ranging from traffic cameras to air quality monitors. These sensors constantly monitor the state of the city in close to real-time. However, the amount of data generated is difficult to interpret at various scales. The usage of AI within the city environment allows us to exploit the increasing amount of data generated in real-time. AI can also interpret data at various scales, both geographical and temporal, and infer the city-wide long-term consequences of decisions. Finally, AI allows us to study how users interact with the cities and the environment. This data can also be used to improve world models by incorporating user behaviour. Come hear how this can be achieved. Dr. Tristan Braud is a senior researcher at HKUST-DT SyMLab as well as the University of Helsinki within the H2O Centre initiative. His major research interests include mobile computing and human-centred system designs, with a strong focus on Augmented Reality and Human-AI interactions. With his research, Dr. BRAUD aims at bridging the gap between designing novel systems, and the human factor inherent to every new technology. Jimmy Storrier is a 20+ year veteran of technology and data driven marketing. Jimmy headed the team that launched the first online long form content streaming video service in one of Australia’s largest media companies and has also worked in a number of high growth startups at Marketing Director and General Manager. Jimmy has taken a data driven approach to planning and business growth, being an early adopter of Google Analytics and Tableau, supporting useful insight generation through visualisation and sharing team and business performance metrics openly. His current passion is working with Machine Learning based predictive analytics and segmentation to drive improved sales and marketing outcomes. He is currently the CEO of Aquient, a data-driven customer experience agency based in Asia. AI Society of Hong Kong is committed to the further development and understanding of Artificial Intelligence technologies in Hong Kong. With our monthly events and technology workshops, we aim to develop inquiry and curiosity about AI among those who are not in direct contact with this science. Together we can create a platform for specialists to share their ideas and knowledge to help us prepare for the many benefits and challenges that this technology will create in the coming decade.